Time has, it goes without saying, not been kind to the core cast of Funky Winkerbean, the ones who were all in high school in the original, carefree iteration of the strip, and even though they look extremely wizened and beaten down, I guess they’re supposed to be at the oldest end of Gen X, now in their early 50s. This puts them squarely in what’s being called the “sandwich generation”: forced to simultaneously care for both their belligerent and confused Greatest Generation parents and their smarmy, unlikeable Millennial children. You’d feel bad for Funky and his cohort if not for the fact that they themselves are also completely and utterly insufferable. Hmm, Rusty, did you ever think that maybe Becky is selling the copies on the black market as an elaborate sting operation to catch the artifact-rustlers who have been plaguing the Yucatan for far too long? 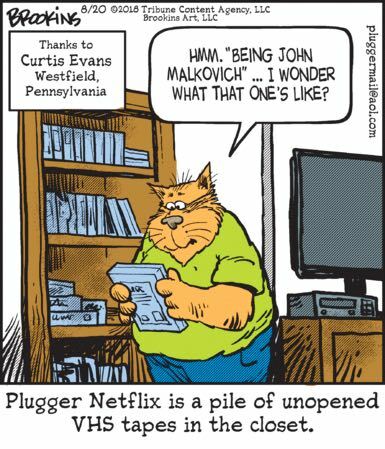 I mean, she’s not, of course, because everyone in Mark Trail is exactly as villainous as they appear, but still! Anyway, I’m enjoying the vision of Becky spending years making and discarding two-dimensional copies by just jamming them into a photocopier, shaking her head and waiting for the day when technology finally catches up with her criminal ambitions. It’s bad enough that the animals rose up and largely exterminated humanity and then moved into our cities and took over our civilization as if it were theirs. But now they’re erasing our history, producing films that imply Cleopatra and her subjects were something other than full-blooded H. sapiens. I know casting minority actors isn’t always “convenient” for directors who have a core set of performers they usually work with, but I’m sure that Slick Smitty is available and more than willing to wear a wig.